Magister Therana is a Dunmer magister of House Telvanni, stationed at Tel Branora. She is largely distrustful of outsiders. A Hireling of House Telvanni: Help Sun-in-Shadow earn her freedom. "Oh, excellent. Another clumsy adventurer bumbles into my home. I really must put a hex on that lift …. Have you come to rob me? That would go very poorly for you." My name is <Character Name>. I come on behalf of Sun-in-Shadow, an Argonian in Sadrith Mora. "Sun-in-Shadow … ah, yes. I know the lizard. An enterprising young mage, if memory serves. Don't look so surprised. Her magical abilities are the worst-kept secret in Sadrith Mora. What does she want? I hope you bring more than boring salutations." I have the finger bone of Saint Felms, taken from Zaintiraris. "Do you now? Well she is a clever one, isn't she? Even convinced you to do the work for her? Impressive. So, what does our scaled friend want in exchange for this relic? No, no, no, give me a moment. I'm keen to guess. She wants her freedom, right?" Yes. She needs you to endorse her bid for freedom and sponsor her as a Hireling of House Telvanni. "Oh, good. I was afraid she'd do something boring with her freedom, like run off into the marsh to worship trees or some such. Sun-in-Shadow shall have my endorsement. I'll give you a writ. Deliver it to my Mouth, Eraven. He'll know what to do." Magister Therana : "There. That should be sufficient. Now, take that writ and be off. I have a relic to study." "Well? Pick it up! Did you expect me to magically waft it over to you?" "Honestly, what does a mer have to do to get some peace around here? What do you want now?" "Oh, by all means, ask away. I live in a foreboding and nearly inaccessible tower because I adore conversation." Why couldn't you have simply gone into Zaintiraris yourself? "I'm a Magister, not some thick-heeled errand girl. Besides, Zaintiraris lies in Redoran territory. Provoking another Great House disrupts the natural order of things. I can't abide disruptions. Better to let expendable peasants do it for me." What will you do with that relic? "Oh, I'm so glad you asked! I love sharing the private details of my research with total strangers. That was sarcasm, in case you missed it. My experiments are sensitive, complex, and none of your business." Sun-in-Shadow said you were new to your rank. "I've only recently become a magister, it's true. But don't think me some suckling babe. I should have been promoted ages ago, but that antediluvian hag, Dratha, kept finding reasons to delay it. With any luck, she'll die soon." Why live in a tower way out in the wilderness? "Peace. Quiet. Some small measure of privacy. Alas, thick-headed adventurers insist on dropping by for long, boring chats." 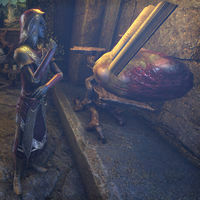 Therana appears in Morrowind and as a card in Legends. She also is referenced by another card in Legends, Therana's Lawman. This page was last modified on 30 January 2019, at 03:03.